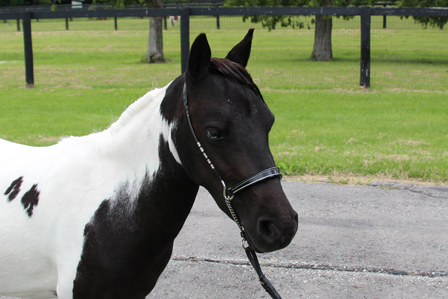 Genetics: (TT) Homozygous For Tobiano & (EE) Homozygous for black factor. Horse carries two copies of the black gene. 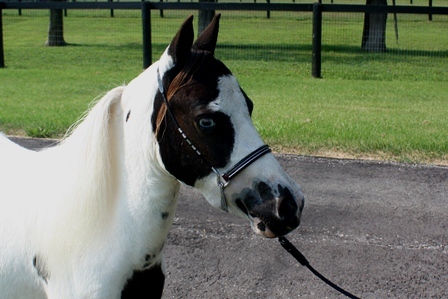 Horse is black based. Notes: Hula Bug is a half sister to Hale Farms Tough N Tropical Kahlua - who has a AMHR halter hall of fame. Colour: Sorrel Pinto - 31.5"
Colour: Bay Pinto - 31.5"
Colour: Bay Pinto - 30"
Colour: Dapple Grey - 33.75"